Atom is a free and open-source text editor for macOS, Linux and Windows. It is preferred by many developers for its great design, clean interface, and the excellent ecosystem of community-built packages. In September 2017 GitHub and Facebook announced the release of Atom-IDE - a collection of optional packages that bring IDE-like functionality to Atom. In this article we are going to show you how to get started with Atom-IDE and look at some of the new features. Go to the Packages tab-> Settings View-> Install Packages/Themes. Search for and install the atom-ide-ui package to bring in the IDE user interface. Atom IDE works with a selected number of languages, you will need to install each language pack separately. The initial release comes with 5 official language packs. They enable smarter context-aware autocompletion, code navigation, and error handling for that specific language. There are also a number of community-made packages for other languages. Autocomplete is included in all the ide packages. Just start typing and it will show you suggestions, matching what you have typed so far. Click on the red exclamation mark and yellow warning triangle at the bottom left of your Atom window and you will see the Diagnostics pane. It shows you all the errors and warnings in the current file. You can also right click them to move to that line in your code. This new feature shows you all the references of a class or variable. Select the class or variable you are interested in, then right-click it and select Find references. When you hover the mouse over a type or other supported object, you can see some additional information about it, such as its properties and methods. Another new feature which lets you see a tree-based outline view of your document. It allows you to quickly look through your classes, functions and other code blocks. Move your cursor to a variable and you can highlight other references of that variable. You can also CTRL+ left click on a class or variable reference to navigate to the place it is defined. minimap - It provides an eagle-eye view of your document, which makes it easily scrollable. highlight-selected - With this package, when you double click a word, all the matching words in your document become highlighted. project-manager - Gives you fast access to all your projects and an easy way to manage them. You can browse more packages in the atom package store. The release of Atom-IDE offers a number of new features, which can make coding a much more pleasant and enjoyable experience. Right now it supports only a couple of the most popular programming languages, but thanks to a big and active community we can expect even broader language support in the future. If you enjoy the Atom editor, you should absolutely give Atom-IDE a try! 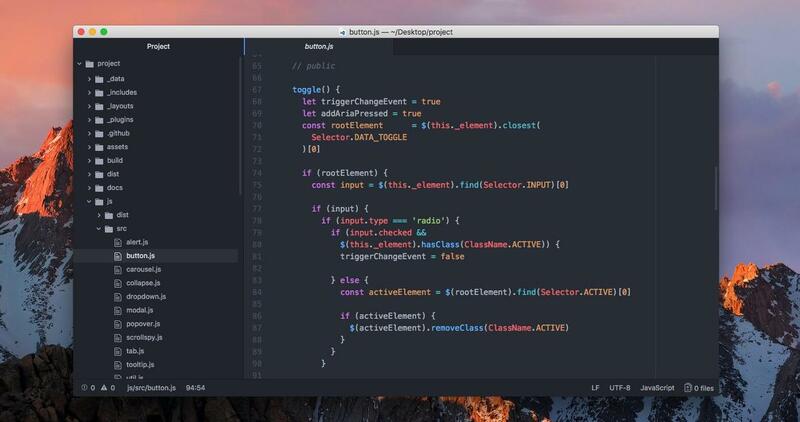 The one thing I absolutely hate about Atom is that it's built on Electron. All of a sudden, it will become slower than my old win95 pc. It will lag like a mother-f#!ker.. So yeah. Try to limit yourself to only one electron-app. Rather don't run any. Electron is crap. The one thing I absolutely hate about Atom is that it's built on Electron. All of a sudden, it will become slower than my old win95 pc. It will lag like a mother-f#!ker.. And it only gets worse if I'm running HyperTerminal & Spotify at the same time (other Electron apps) So yeah. Try to limit yourself to only one electron-app. Rather don't run any. Electron is crap. I should say that I'm currently using Atom, even though I fckn hate it.. I don't wanna go back to sublime..
Each feature in the article make me think "wait, vim has this since years... This too... "
Vim is the Way 😀 Each feature in the article make me think "wait, vim has this since years... This too... "
I agree with you. But could you explain why not Sublime? This is not bad. But please publish an article about Sublime Text which I think is better . Thanks. This is not bad. But please publish an article about** Sublime Text** which I think is better . Thanks.